Building a Beach in Shepparton - Aquamoves – Indoor and outdoor pools, fitness facilities and programs in Shepparton, Victoria. The build has begun. Shepparton will host a world tour beach volleyball event next weekend, bringing more than 3000 spectators to the town. Before then, 27 truckloads (or 800 tonne) of sand will be delivered to Victoria Park Lake during the next few days to build two world-standard beach volleyball courts. But it’s not as simple as picking it up froma quarry and dumping it in Shepparton. 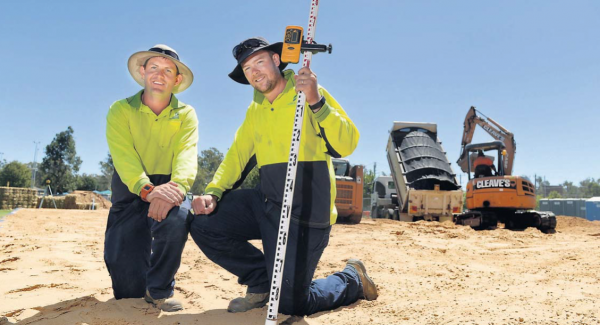 The 50-tonne trucks bringing the sand from Tocumwal are a wee-bit too heavy to drive on our local bitumen roads. So the sand has been dumped on the outskirts of town and will be ferried into the venue by smaller 10-tonne trucks. Predicted to bring in more than $1 million of economic stimulus to the region, the event will host the world’s best male and female volleyball players. As well as a small mountain of pristine sand, 200 hay bales and 20 m of builders’ black plastic will be used to build a retaining wall and set the foundations for the two courts. Volleyball Australia chief executive Mathieu Meriaux said the event, with $20,000 prize money up for grabs, was offered to a number of councils but Shepparton ‘‘kept on saying yes’’. ‘‘This is going to be a big event for beach volleyball in Australia and we are incredibly excited to be bringing it to the vibrant sporting community of Shepparton,’’ he said. Mr Meriaux said Volleyball Australia hoped to host coaching clinics among other side events before, during and after the event. Shepparton will host the Federation Internationale De Volleyball World Tour on March 3 to 5 and again in 2018. Article curtesy of The Shepparton News on Saturday 25 February 2017. Written by Hayden Thomson. Photo by Ray Sizer. Under construction: Greater Shepparton City Council parks, sport and recreation team members Paul Parsons and Louis Worm at the beach volleyball courts being built at Victoria Park Lake.